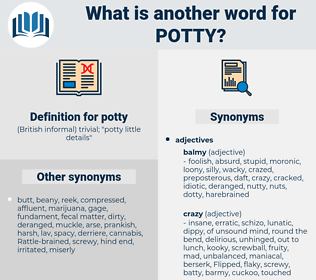 What is another word for potty? 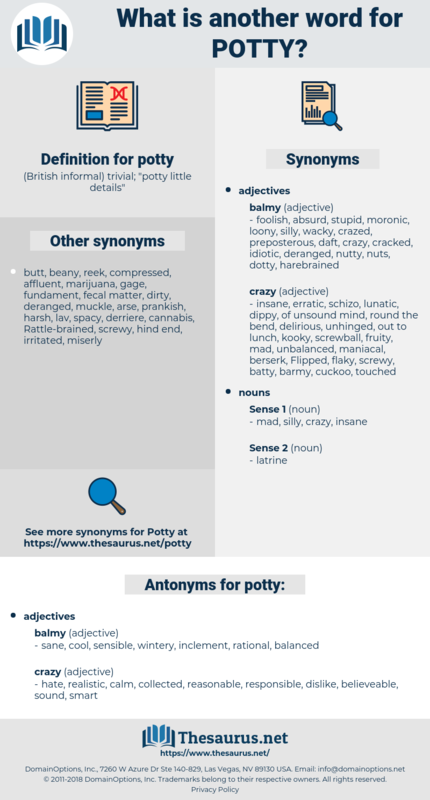 ( British informal) trivial; " potty little details"
sane, cool, sensible, wintery, inclement, rational, balanced. hate, realistic, calm, collected, reasonable, responsible, dislike, believeable, sound, smart. important, democratic, unloving, sober, humble, modest, unpretentious, egalitarian, of import. I want to get people to understand that in the future we shall not divide water, in this petty way, into potty little ponds and lakes and rivers: it will be one big satisfying thing, the same everywhere.